HTC was once known for its impressive & innovative phones, but now, it’s nowhere near the top 10 smartphone brands in the world. Now, it is not because HTC doesn’t launch phones now. The company launches phones every year from the budget devices to the flagships. But, they are usually overpriced when compared to what the other phone companies offer. In December last year, HTC announced that it would focus only on the mid-range and flagship phones in 2019 to improve its market share. 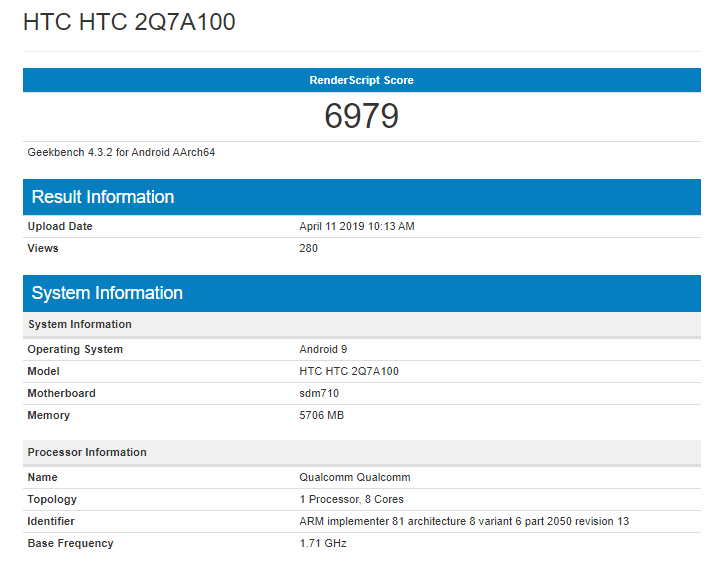 Now, an unknown mid-ranger from the company showed up on Geekbench recently which confirms that HTC is still making phones. The phone is powered by the Snapdragon 710 processor which we see on a lot of mid-rangers these days. The phone showed up with the name HTC 2Q7A100, and we don’t have any information on what the official name is going to be. It runs on Android 9 Pie out of the box, and there is 6GB RAM. If the company is indeed going to launch such a device, let’s hope that HTC would go for aggressive pricing.